The comet 67P/Churyumov-Gerasimenko is under the close investigation processes of the lander Philae. There are some claims about the probable microbiological alien life on the comet. Two top astronomers Chandra Wickramasinghe and Max Willis say that some characteristics of comet 67P/Churyumov-Gerasimenko might be a clue for the existence of some living micro-organisms beneath the icy surface. The most important characteristic is the dark black crust containing some organic molecules. 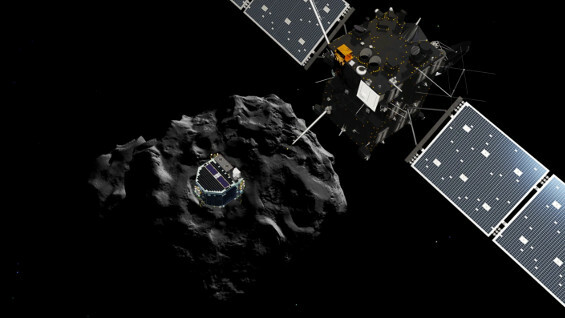 However Rosetta and Philae are not equipped to search for the evidence of life. Wallis said “Rosetta has already shown that the comet is not to be seen as a deep-frozen inactive body, but supports geological processes and could be more hospitable to micro-life than our Arctic and Antarctic regions”. On the other hand, some other scientists are more sceptic and say that the dark organic compounds can be found on the surface of comets and it does not show the evidence of microbiological life. admin tarafından 2:24 pm itibariyle gönderildi. Tag:67P/Churyumov-Gerasimenko, alien life, comet, philae, Philae finds alien life?